Challenge | Life is Good… But the Best is Yet to Come! Ha! I’m still figuring that out! This is the first time in my adult life that I haven’t had a paying job, a workplace to go to everyday… And yet, “What do I do?” seems even more complicated than ever before. I’m hoping, soon, I’ll be able to say, “I’m creating a home for my husband and kid to thrive in with love, stability, and joy.” That sounds like a nice mission statement for a SAHM mama, right? And then Hubby comes home… And we try to have dinner together, feed Sawyer, give him a bath, read to him, and put him to bed… By the time that’s all done, I’m exhausted. Normal, right? I know. But… I’m working on finding more ways to be “present” in the evenings, too. I pictured staying at home as a gift not only to the baby, but also to my husband. I hoped to make his life easier, too. And I don’t know if I’m really accomplishing that yet. We’re still figuring it out. I’ve always been a homebody – and so far, I really am loving this new job. I feel like I do pretty well with the kid. I’m working on maintaining the house in a way that a little gets done everyday – so it never becomes an overwhelming chore. I’m starting to cook healthy meals again – which feels FANTASTIC! I’m making our own baby food (which is so fun and easy – and makes me feel like I’ve accomplished something!). I’m starting to get out more, both with and without Sawyer. What do I do? I’m creating a home for my husband and kid to thrive in with love, stability, and joy. The key word is creating. Meaning, it’s in process. It’s happening – slowly, with hiccups, and lessons to learn. But we’re on our way. And that’s what matters. 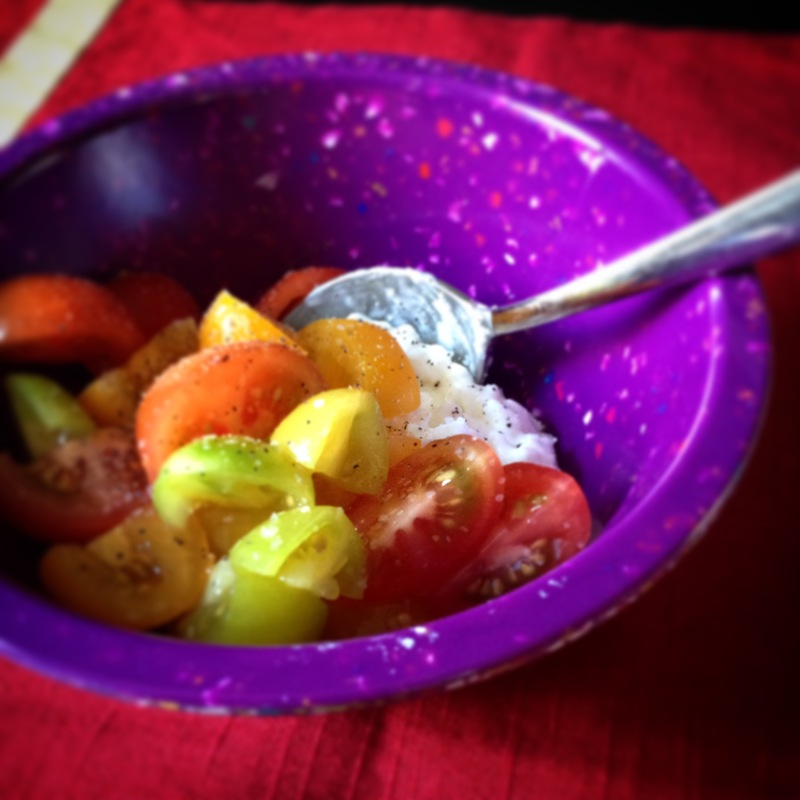 Mmm… Cottage cheese, heirloom cherry tomatoes, and a little salt and pepper. This is my favorite snack right now. Yep. You heard me. Quite the switch from chocolate anything a week ago! Whole grains. Fruits and vegetables. Lean proteins. I feel like a switch has been flipped and I’m well on my way again! So my question is… Why do we sabotage ourselves? I know I like eating healthy. I know the fresh foods taste good. I know I feel better when I eat this way… And yet – it’s so easy to get derailed. Why? I think for me, it’s a convenience thing. I like foods I can grab and go. Fresh food takes planning, preparation, and has to be eaten before it goes bad (so if you buy too much and get sick of it after 2 servings – oh well! Finish ‘er up!). I’ve spent the last several months doing the grab and go thing – and now in the space of one week, I have loved giving thought to what I put into my body and the small amount of time I’ve put into preparing snacks and meals. It’s kind of a brief meditation during the chaos of the day. A moment to myself – even as the little one is bouncing in his jumper to jungle music and shrieking with glee. It feels like a reward for making it through the last 6 months. So, anyway… The diet changes are being made. Now, this week my challenge is to bring back exercise. The plan is for my hubby to take the kid when he gets home from work so I can exercise for a while. We’ll see how this goes… I figure if there’s a plan that involves others, I may actually stick to it! So, how do you sabotage yourself? (I think we all do in some way…) And do you have any new challenges ahead?